Larger – with an additional hall – and even more international and closer to the market it represents. 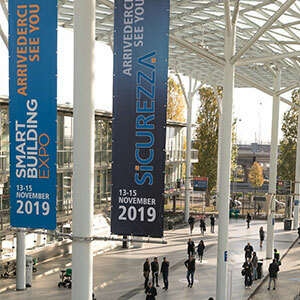 SICUREZZA 2019, the event organised by Fiera Milano that will take place next year from 13 to 15 November, aims at achieving these objectives. Drawing on the important results achieved last year – 25,569 certified professional visitors (+35%) and 465 direct exhibitors (+40%) – SICUREZZA 2019 is ready to continue its international development, which has turned it a into major European event for the Security & Fire industry. The project will focus on the challenges of this industry, its constant evolution, and the changing roles and professions. In an increasingly digitised and interconnected world, given the growing integration and interoperability between different systems, security technology has become essential in any field. From a simple protection tool, it has turned into an important strategic element. Technologies don’t just perceive an alarm. Today, they also monitor and connect different processes, collect and manage data, interpreting them in a smart way. That’s why the 2019 edition of SICUREZZA will focus on integrated solutions and cyber security, a cross-cutting topic for the management of increasingly smarter technologies that are also asked to protect and transmit data. Moreover, given the increase in demand for public security, SICUREZZA 2019 will pay special attention to urban security, an application field to which companies are dedicating quite a number of solutions. In the background, the Italian market continues the positive trend of the past few years, thanks to its constant evolution and increasing demand for security at all levels. 2017 closed with an overall turnover increased by 7.2%, +6.6% of exports (source: ANIE Sicurezza, June 2018). This sector confirms to by dynamic. On the one hand, Italy has the production and technological capacity to penetrate into international markets, and on the other hand it represents an interesting market for international players who are looking for new opportunities. That’s why SICUREZZA aims at being an internationalisation tool. And to do so, it keeps investing in international presentations and incoming top profiled buyers from interesting countries from a business point of view, especially Southern Europe and the Mediterranean Basin. The international roadshow has already started. It will be an opportunity to meet players from all over Europe and present the project and the opportunities that the Italian market can offer. SICUREZZA will give a few presentations in different countries during workshops, events, and trade fairs. There will be also presentations in Italy. The first stop of the national roadshow will be at Smart Building Levante, the event dedicated to building automation that will take place in Bari in November. Here, SICUREZZA will have the chance to meet players and producers from the South of Italy and show them the latest news of the new edition. Its presence falls within the collaboration with Pentastudio. Even in 2019, the event will take place simultaneously with Smart Building Expo, the trade fair organised by Pentastudio and Fiera Milano, which will add other two product areas in this edition: smart city, which will focus on 5G connectivity, and renewable energy production, respectively. A safe and smart city will be the common thread of the two events, in a context of increasing synergy. There are many common elements between smart building and security technology. This bond is getting closer in relation to the integration between systems that connect civil plant engineering with advanced technologies, which require security solutions that ensure protection.